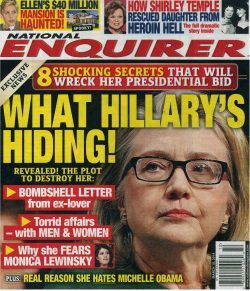 While the mainstream press and politico elites like Mitt Romney and MSNBC’s Joe Scarborough, dilly dally and debate the relevancy of revisiting Hillary’s unelected co-president role during the Clinton White House era, the National Enquirer goes where the mainstream press treads not and called me last weekend about Hillary and the death of Clinton White House lawyer Vince Foster. Days later, suddenly I’m Secret #1 and Secret #2 in the Enquirer’s “blockbuster world exclusive” cover story: 8 Shocking Secrets that will Wreck Her Presidential Bid. What Hillary’s Hiding! Revealed! The Plot to Destroy her. It was such a well kept secret that I didn’t know about it either. Apparently, I am a part of a shadowy dirty tricks campaign that is bankrolled by super wealthy anti-Clinton factions to the tune of half a billion dollars. That part was news to me and I hope it is true because I could use some back-up getting the info on Hillary out that is documented in my books, The Whistleblower: How the Clinton White House Stayed in Power to Reemerge in the Obama White House and on the World Stage and Following Orders: The Death of Vince Foster, Clinton White House lawyer. The fact is no dirty tricks are required when it comes to Hillary—the truth is damaging enough. That’s right. This is not my opinion. It is based on facts. The Clinton’s record of lawlessness is sourced in my books, like this gem from the 1996 Senate Whitewater Committee Report regarding the Vince Foster death investigation. The committee concluded: “The actions of these senior White House officials constitute a highly improper pattern of deliberate misconduct,” or as it would be called for everyday Americans, obstruction of justice. As a comparison to show Hillary’s special treatment that has allowed her to dodge indictments, consider the criminal insider trading investigation involving home decorating mogul Martha Stewart. In 2004, Stewart was convicted of obstructing justice and lying to federal investigators over selling a stock. She was also found guilty of attempting to lead the government investigation astray and served time in prison. Stewart’s crimes appear to be far less nefarious than the lawlessness in the Clinton White House—specifically Hillary’s counsel’s office. Why convict Stewart and not Hillary and her staff for obstruction and lying to investigators? Where’s the “fairness” in that? Hillary’s lawlessness record wasn’t isolated to the Foster death investigation. It happened during the other investigations like Travelgate, the first Clinton “scandal.” As reported in my bookThe Whistleblower, Hillary circumvented the rule of law when she sicced the FBI on the Travel office. That’s right. Withholding subpoenaed evidence is a crime. Hillary 2016. Prison or POTUS (President of the United States)? Congress, the justice department, and special prosecutors have a constitutional duty to faithfully enforce the laws. They failed in that duty during the Clinton era which arguably has given rise to the lawlessness today in the Obama administration. While the latest poll shows that a majority of Democrats want Hillary to run for president, and NBC News is reporting that the Clinton machine is revving up for 2016, don’t voters who were too young to remember the Clinton era or were not born and are of voting age today deserve to know Hillary’s real record of dodging indictments? The Enquirer was correct when they exposed former Democrat Presidential candidate John Edwards. Let’s hope this alleged cabal of deep pocketed anti-Clinton factions The Enquirer is reporting exists is alive and kicking. If so, they should contact me pronto. There’s nothing wrong with reporting the truth. It’s called journalism. It’s a public service and what the media is supposed to do. No dirty tricks or conspiracies are required. Instead it is the complicity and cover-up for the Clintons in the “media” that is the problem. Update: People really should call first before they quote from The Enquirer or elsewhere. This is not just an issue for me, but for others. It’s incredible to see how a chopped off quote became a “quote” othe Internet. The original source regarding any alleged claims about Hillary Clinton’s role in Waco, repeated anywhere, including but not limited to, The National Enquirer, is not me (I did not write about WACO in my books either), it would be Linda Tripp. Linda Tripp served in the Clinton White House counsel’s office, was there when Waco happened and has spoken publicly about it. Author: Re Hillary Clinton Ordered Attack on David Koresh’s Compound in Waco, Texas….. ““Investigators are out to show that during Bill’s first year in the White House, Hillary was abusing her power and actually making executive deci­sions, one of which was allegedly the raid on Waco.””… ETC. Hillary PRISON or POTUS 2016 campaign buttons! 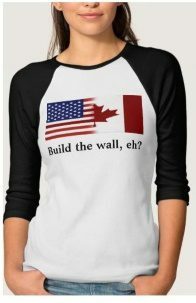 Click to buy and scroll down. Pick your size & shape.